Just Too Busy is the story of the Kraft family's head-on collision with busyness and the 12-month experiment that changed their lives. When their children could recite the dollar value meals at McDonald's faster than the times-tables, Joanne and Paul Kraft knew something was very wrong. So, instead of continuing their busyness habit and fitting more into their schedules, they took a year off from all extracurricular activities and learned how to be a family again. In this book, readers will laugh their way to learning the 10 telltale signs that they're just too busy and find the courage to guard their families from the temptation of constant distraction. Joanne Kraft has a passion for encouraging women. A sought-after speaker, Kraft has been published in Today's Christian Woman, In Touch, ParentLife, Kyria, and P31 Woman Magazine. 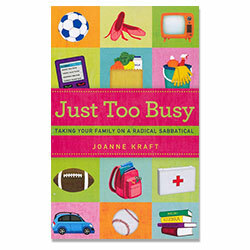 Joanne is the author of Just Too Busy, published in 2011. She lives with her husband and four children in the California Sierra Nevada Foothills.